Six Sigma Global Institute (SSGI) is a registered education provider (REP). SSGI is qualified to offer Project Management PDU credits for the Project Management Institute (PMI®*). 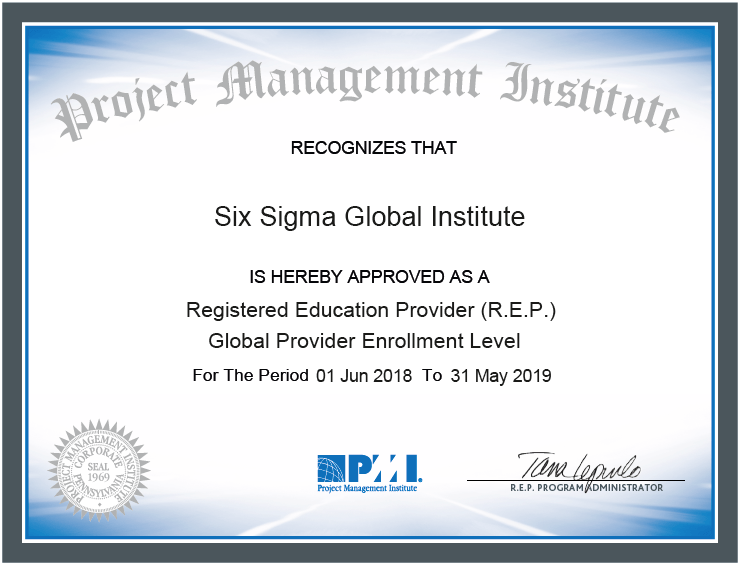 Six Sigma Global Institute has successfully passed the Project Management Institute (PMI®*) review process. SSGI is authorized to display the PMI R.E.P®*. logo prominently on our website. This label guarantees Six Sigma Global Institute courses satisfy PMI®* quality assurance criteria. Students may earn PMI®* PDUs upon completion of approved courses offered by PMI®* Registered Education Providers (R.E.P.s), such as SSGI. These PDUs may be used for fulfillment of PMP®* requirements to earn or maintain your PMP®*. We are also approved for PDU credits. *PMI and the PMI Registered Education Provider logo is a registered mark of the Project Management Institute, Inc.